I’m grateful to be featured in Kosmo today on the Tanda Bahagia segment on things that make me happy. There are many ways teachers can be motivated and engaged professionally and on a personal level. To me, it is important to sustain your passion as a teacher by sharing and learning from one another. Being a constant learner is essential as with the robust changes happening in the education system, it is vital to be a lifelong learner. Apart from that, I believe a teacher needs to find her vocation in life. 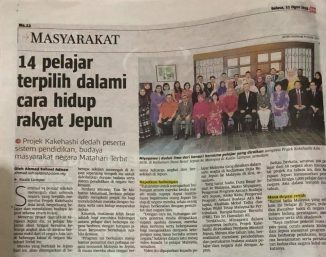 To me, I would like to contribute to my nation by content development, organising projects with my students on leadership, intercultural and language awareness as well as be part of a thinktank on our education system. I feel that our education system has so many potentials but perhaps we need to improve its execution and monitoring process. I do not want to be a whiner but I would like to do something to rectify the situation. If you don’t like it, you have to fix it. We do what we can within our means. 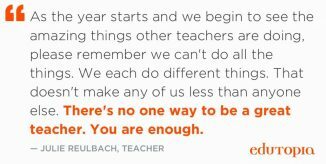 Maybe we felt we are not good enough but believe me, each and every one of us is significant in making an impact. We can set ripples to the ocean of education system. 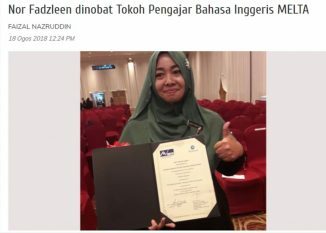 I am proud of her and all the long hour driving from JB to KL to send her for the interview at AFS HQ is worthwhile. Some people asked me why did I trouble myself to do that as the rest of the candidates were sent by their parents. 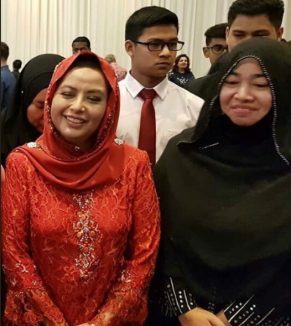 To me, since her parents couldn’t send her off, it’s my responsibility to ensure that she has the opportunity to showcase her abilities and leadership. Putri has been helping me out with English Language Society as well as the Student Leaders Board. Hence. I felt she has the leadership skills to perform and survive in another country. 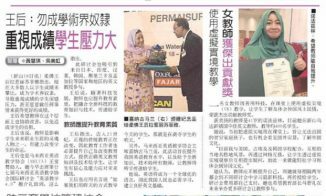 Alhamdulillah, she succeeded and is flying to Japan tonight. She will be studying at Osaka Prefectural Yuhigaoka High School for 6 months. All the best my dear! We thrive by nurturing others to be better. 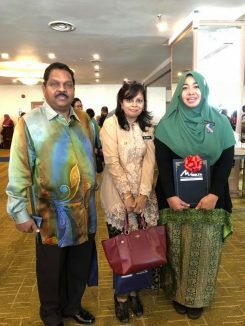 I count my blessing to be the recipient of the Hyacinth Gaudart award from the Queen of Johor at the 26th MELTA International Conference 2018. The award is given to teachers who have contributed significantly beyond the classroom walls. 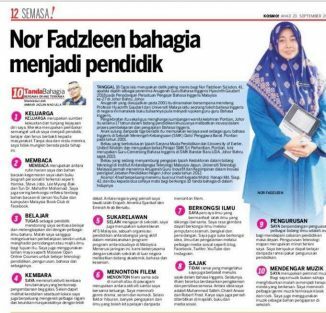 Alhamdulillah, I am grateful to be recognised although there are many inspirational teachers out there who contributed in their own special ways. I started blogging and creating authentic learning materials online since 2001 and I’ve also written books, columns as well as present at various conferences locally and internationally. I advocate global classroom & intercultural projects with schools worldwide. To date, we have collaborated with schools in Saudi Arabia, South Korea, USA, Japan, Italy and Spain. Together we can be better. 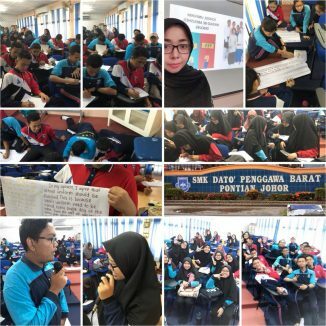 I had great time facilitating Write It Right Writing Workshop with the students at SMK Dato’ Penggawa Barat today. We focused on the fundamentals of essay writing by integrating online interactive platforms such as Kahoot, Padlet and Quizziz. The students conducted collaborative writing to brainstorm relevant points that could be extended into more comprehensive contents in their essays. All the best for your SPM trial exam tomorrow! 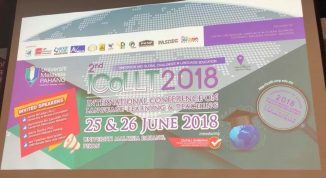 Thank you Universiti Malaysia Pahang for inviting me as one of the featured speakers for ICOLLT 2018. 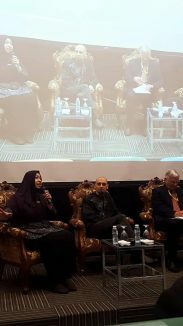 I was amongst the featured speakers alongside Prof. Dr. James McLellan, Dr Nurkhamimi Zainuddin and Dr. Balasz Huszka. I’m blessed to be given the opportunity to represent the teachers amongst the Language experts. I take this as a platform to learn and improve myself. 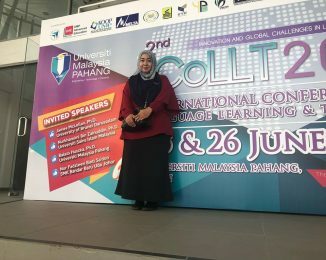 Apart from being the feature speaker, I facilitate a workshop on Virtual Reality and Augmented Reality in Language Learning. I believe that AR & VR has amazing potentials that need to be optimised by all educators. I am no expert but I believe if you share from the heart, things will turn out well eventually. The complimentary flight and accomodation are greatly appreciated. The warm hospitality and smooth conference management are divine. 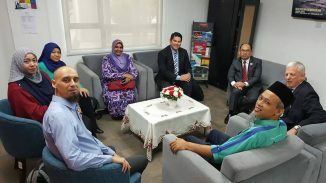 The most important of all, the networking established will enable language practitioners, policy makers and learners from multiplier institutions to sync our efforts in inculcating multilingual education and improving the state of our education system. Let’s hope for the best.